Oguri returns to the mansion only to find Mitsuru beating his father with a crazed look. 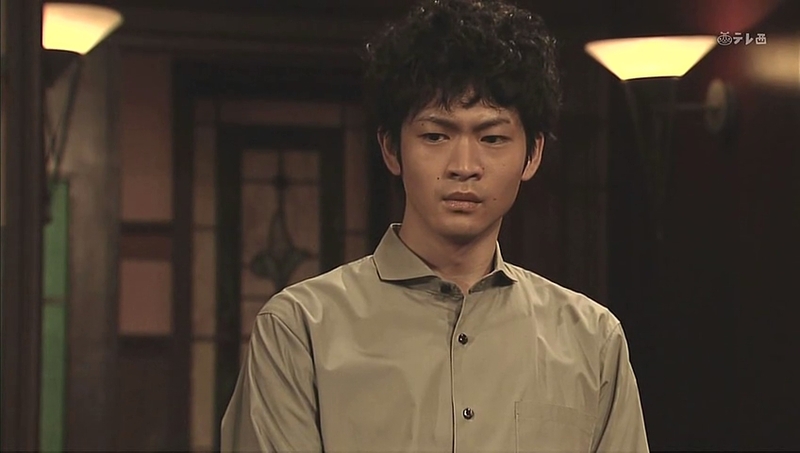 Oguri drags Mitsuru out of the room and tells him that he’s not allowed to hurt his own father. 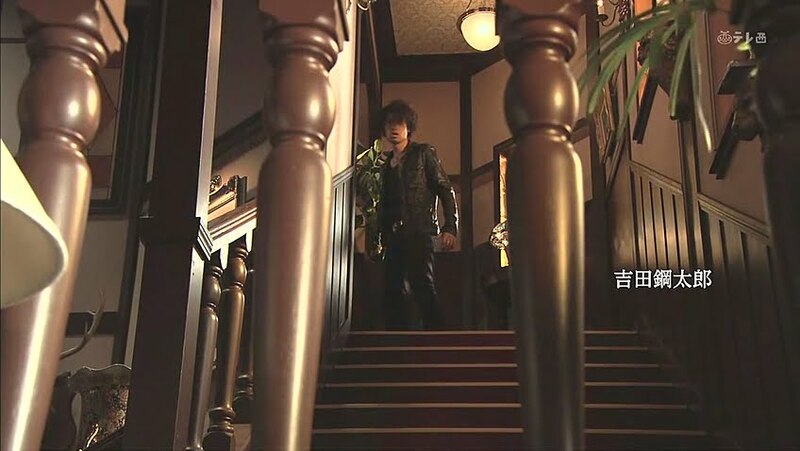 Mitsuru pushes him away and Oguri goes flying down the stairs. 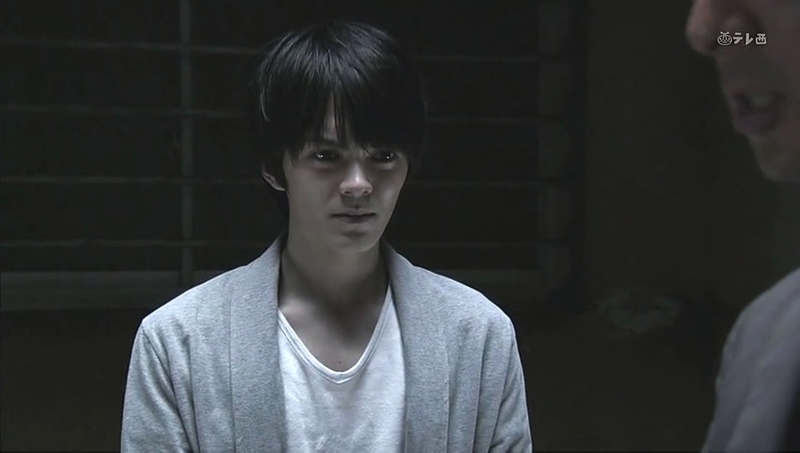 Irie says that Mitsuru is obviously the killer who tried to get rid of the evidence by killing Oguri who recovered. Mitsuru jumps up and desperately says that didn’t happen like that. Irie then goes to the younger brothers and reveals that Mitsuru confessed. 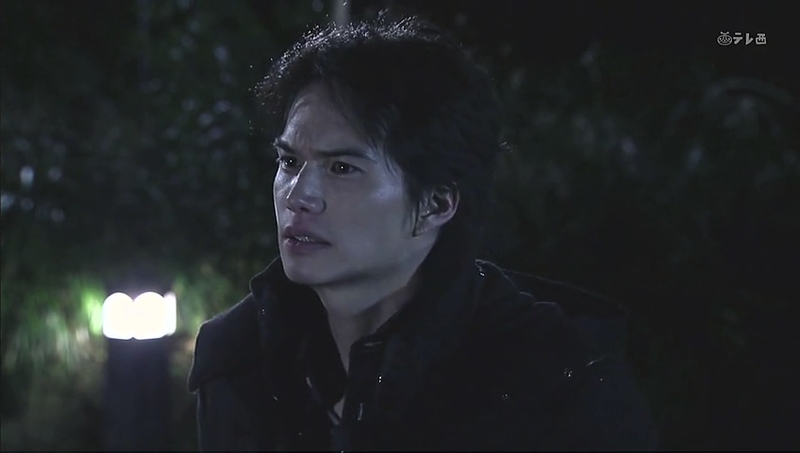 Isao’s face remains passive as Ryo’s expresses great shock. Irie grins and says that they are one step closer to learning about Bunzo’s death. The fleeing Mitsuru tries to get in touch with Kurumi, but she doesn’t pick up. He desperately tells her to call him back right away before he continues running. We then cut to the Kurosawa house where Irie find the visibly shaken Ryo who asks after Suematsu and Oguri’s health. Irie says that both servants have been taken to the hospital and then asks Ryo to come in for questioning before asking Ryo where his brothers are. Mitsuru is hiding when Kurumi comes up. He immediately rushes to her and holds her. He begs her to leave town with him. They can throw everything away and start over—it doesn’t matter if they are both lonely or if Mitsuru gets dragged into Hell. Kurumi pulls away and asks what happened. Mitsuru stumbles back and wonders what’s wrong with him. This isn’t how he wanted things. He wanted to settle things before meeting Kurumi again, but he made a terrible mistake. He apologizes to Kurumi and walks away, but Kurumi quickly calls out that she will go with him. This shocks Mitsuru. He turns around and Kurumi has a smile on her face—she’s not afraid of hell as long as she’s with him. Mitsuru then goes back and grabs her hand and the two start running. They get to Kurumi’s car only to be found by Irie. 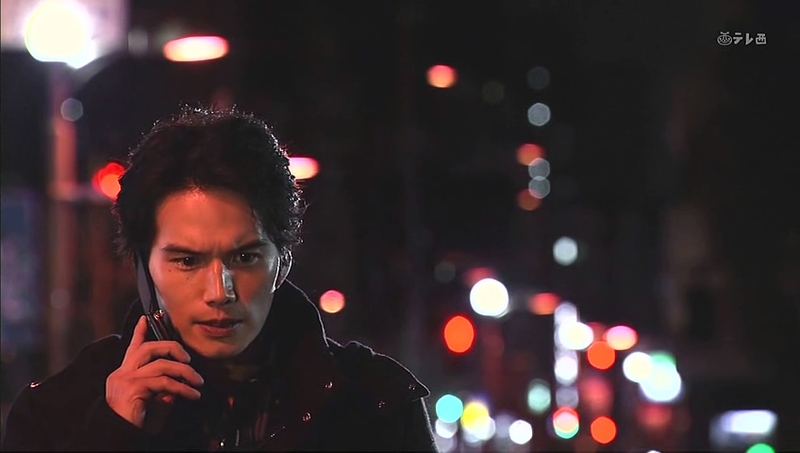 Isao makes it back to Tokyo where he gets a call from Irie asking where Isao is right now. Isao replies in Tokyo. Irie then reveals that Kurosawa Bunzo has been found murdered. 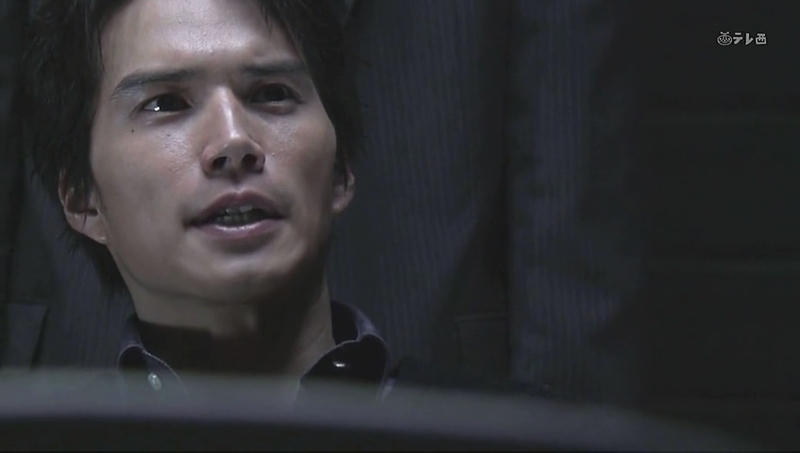 Irie then asks Isao to come back for questioning. 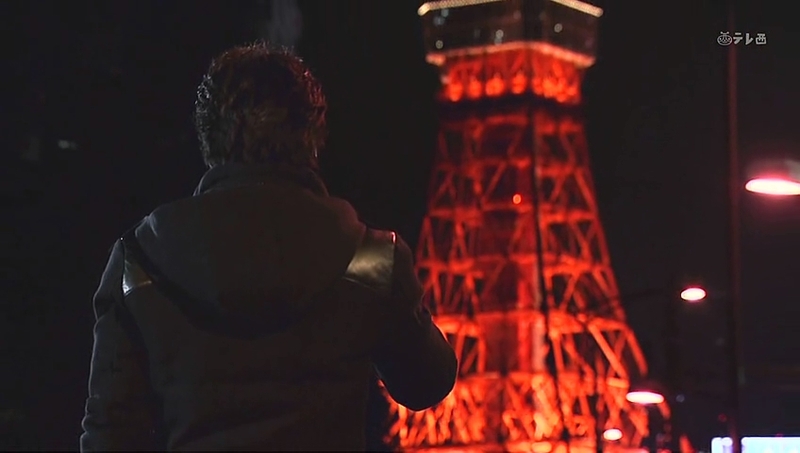 How appropriate that Isao is standing in front of the blood red Tokyo Tower when he hears the news. 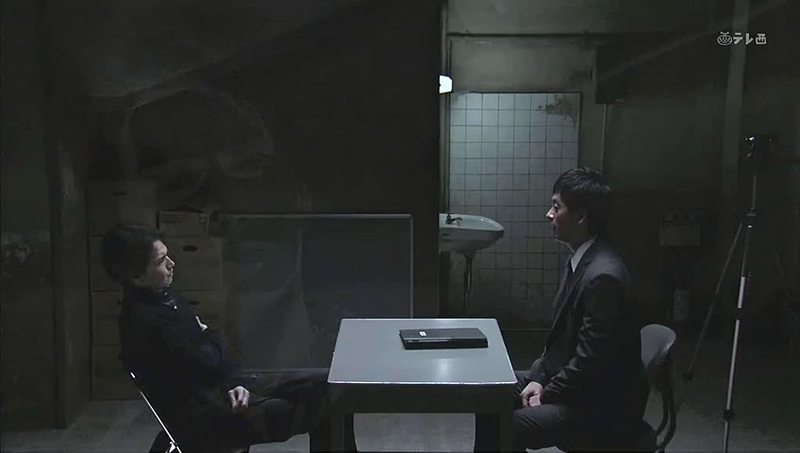 Back in the interrogation room, Ryo says there must be some mistake. Irie replies that there isn’t—Mitsuru admitted the crime himself. Isao demands to know if Mitsuru really did admit to killing Bunzo. Irie says that he is not allowed to say anything. So…did Mitsuru tell Irie why he was at the house that night? Yes, he did, and things became even clearer. Irie again asks the younger brothers just where they were the night of the murder to prove their own innocence. If Mitsuru has already “confessed” to the crime…why do they need the other brothers to prove their innocence? Irie finds it strange that the normally cooperative Ryo always clams up on this matter. What is the younger brother trying to hide? Before Ryo can say anything, another detective comes in and whispers something to Irie who leaves. Ryo then flashes back to his phone call with Isao about learning how their father prostituted their mother and starts shaking. Afterward Ryo goes to his father’s office and begins looking through Bunzo’s desk. He finds an envelope and quickly takes it. As he leaves, he passes by some one. 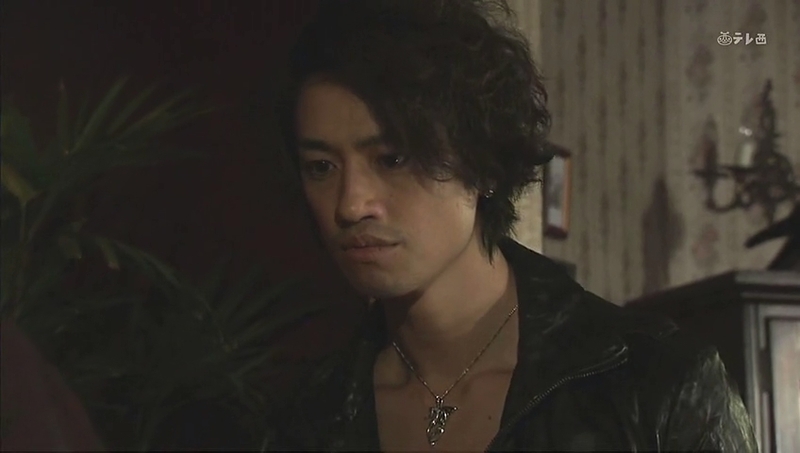 The flashback ends and Ryo is told that he can go home now. Why? What happened? As Ryo is leaving, Ichiro runs up to him. Irie comes and says the little boy has told him everything about what happened that day. We cut to see Ryo finding Ichiro trying to light newspapers by the office on fire. 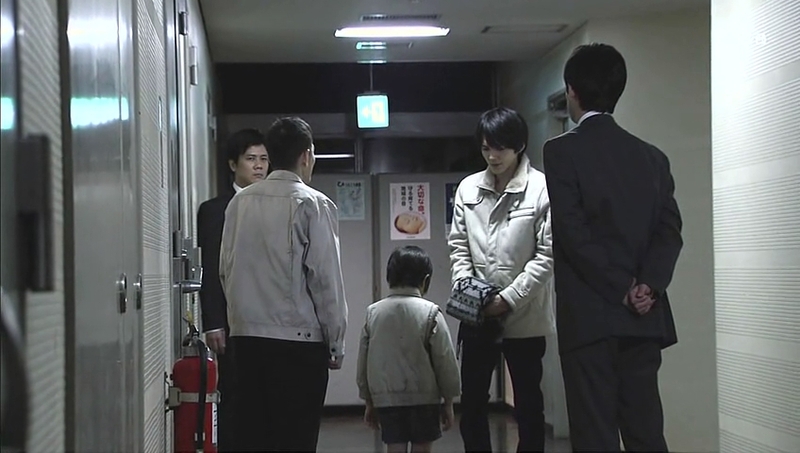 Ryo quickly grabs the little boy and runs when a guard shows up. The two make it to the docks and Ryo asks his little friend what happened. Ichiro hangs his head and starts crying. Ichiro then says they have no choice but to die by the road. Ryo then shows Ichiro the papers that he stole—it’s the papers they were using to sue Ichiro’s father. Without them, they can no longer torment the little boy’s family. 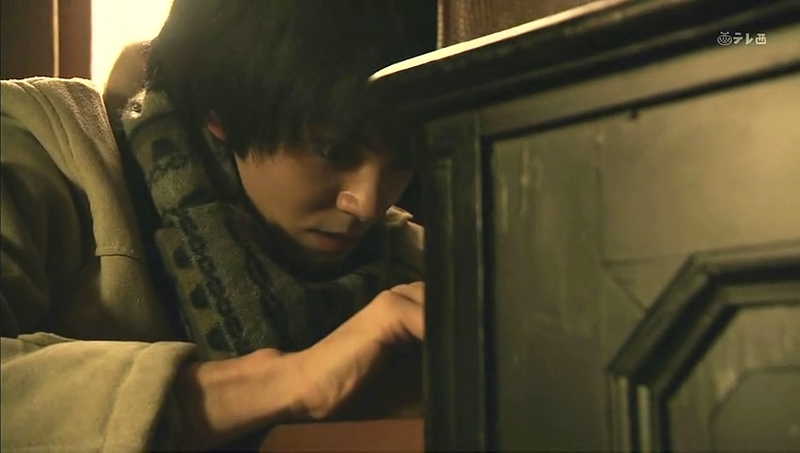 Ryo gets a box and starts stuffing the papers inside to burn. Ichiro asks why Ryo is doing such things, why does he care so much for the boy’s family? Ryo says while the method is not the right one, he must do what he can to protect what needs to be protected. Ryo then lights the paperwork on fire. 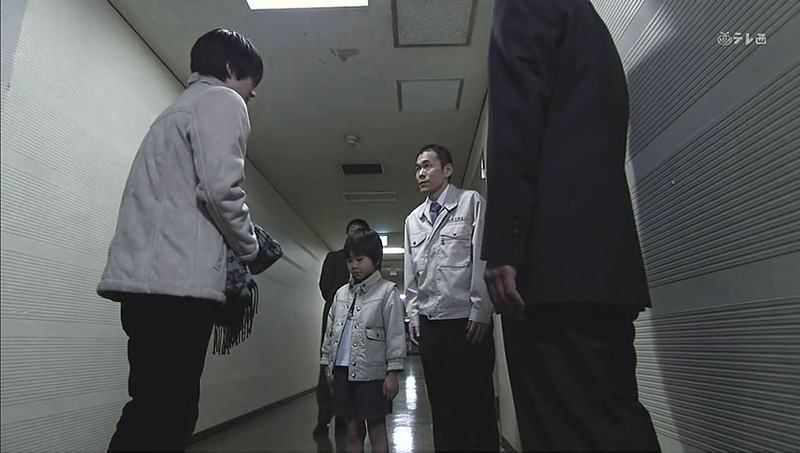 Ryo then swears the little boy to secrecy—a promise between men. 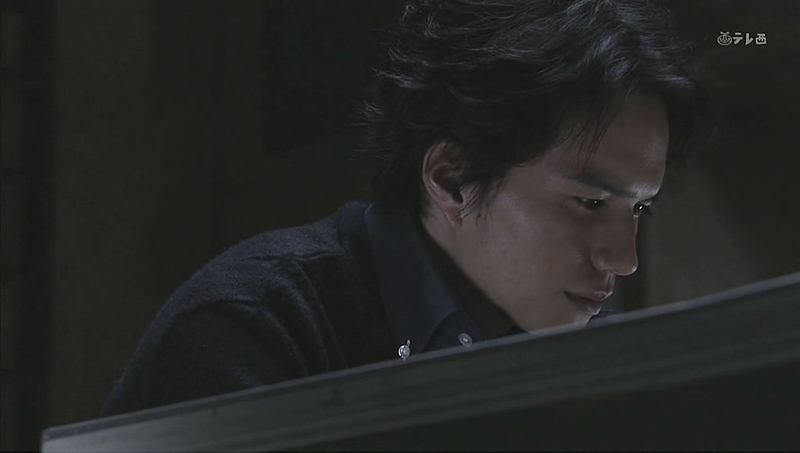 The flashback ends and Ryo asks Sugiyama if this is really okay. Sugiyama says that while helping Ryo means admitting to illegal constructions, Ichiro’s desire to save Ryo made him realize that he can’t stand by and do nothing. 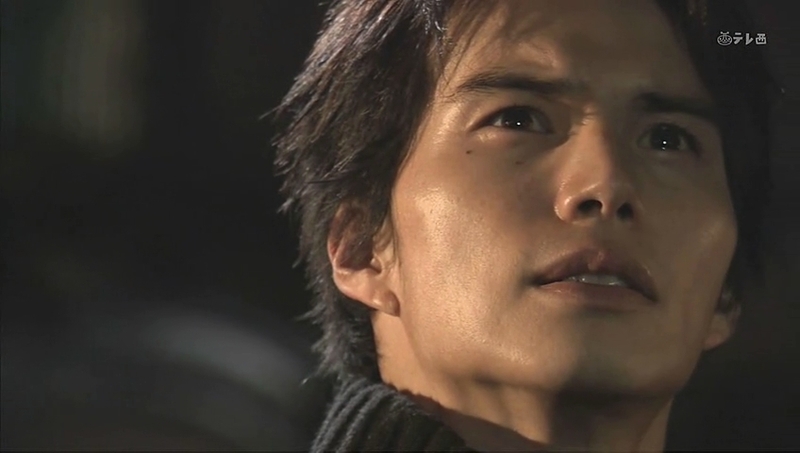 Ichiro then apologizes for breaking the promise between men, but he desired to save Ryo. The older boy bows and thanks the Sugiyama family. 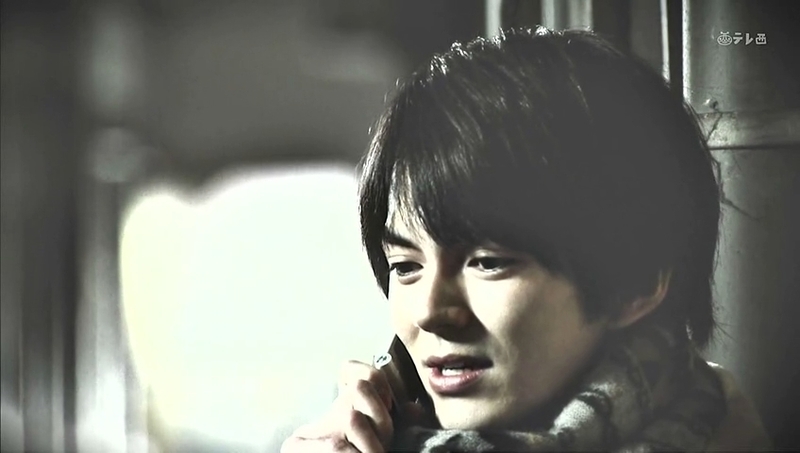 Irie then goes to Isao and tells him that Ryo has been released as they finally have his alibi. 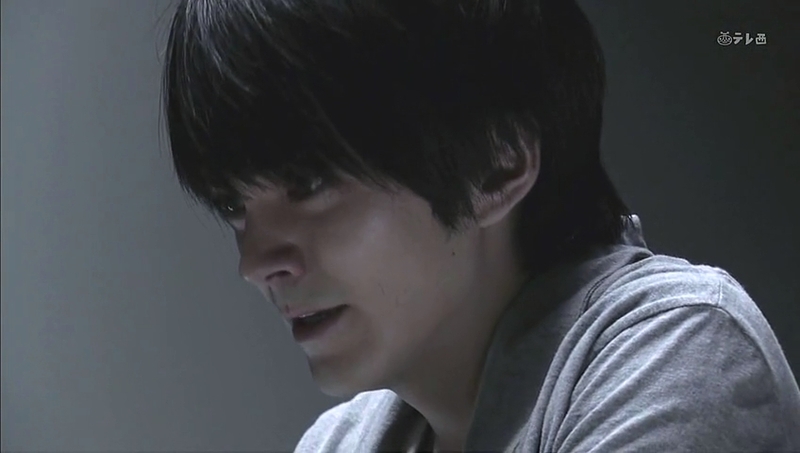 Irie reveals Ryo’s duplicity to save the Sugiyama family and that Sugiyama sacrificed himself and admitted to illegal construction to save Ryo. Isao seems surprised by this. Irie then says that the Kurosawa family is very odd. Ryo ruined what Isao had done. Isao says that doesn’t matter as it’s better that way. Irie then reveals they have Isao’s alibi now as well. A taxi driver revealed that he drove Isao to the station and back to town with a sour look on his face. Isao didn’t get off at the Kurosawa house, so where did he go? Isao reveals he went to the cemetery to talk to his mother since he wouldn’t be returning to the won ever again. Irie wonders why Isao just didn’t admit that in the beginning, but Irie understands Isao didn’t want any comments that could implicate him. 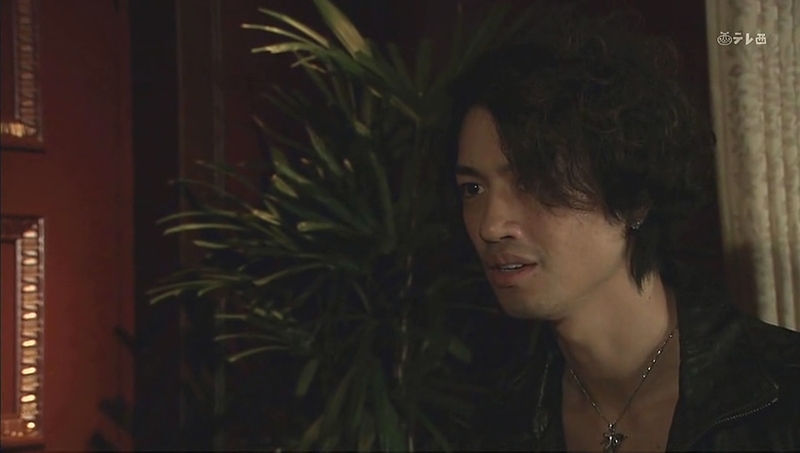 Isao then demands to know why they went through all of this…does Irie really know who the culprit is? Ah, Isao has a WICKED smile. Literally. Irie smiles as well—as expected of a lawyer. Irie says he was trying to figure out if Isao was an accomplice or not, but now Irie is certain. With Irie’s widening grin, Isao’s slips away and he starts shaking. We then see Irie visiting the jumpy Mitsuru who wishes to go home. 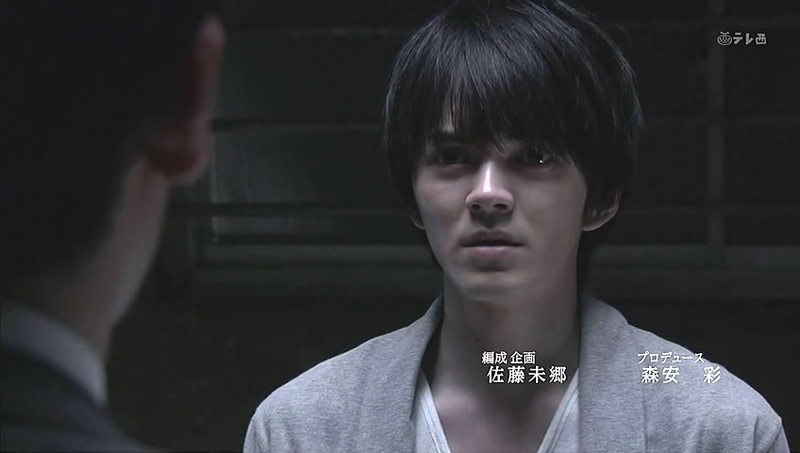 Irie then reveals the warrant for Mitsuru’s arrest for assaulting Oguri and killing his father. Mitsuru’s eyes widen in shock and we flashback to the day of the murder again. Mitsuru goes home to see his father who yells at him for entering without permission. Misturu asks to talk to Bunzo about Kurumi. Bunzo cannot believe his son is still interested in Kurumi. Bunzo also reveals that he loves using Kurumi to dupe stupid men like his son. Mitsuru goes up to his father and bows to him, begging him to let Kurumi go. Mitsuru says he will take her and start over. Bunzo refuses to give such an asset to his loser son. Mitsuru then explains Kurumi’s pain and how he wishes to stop her revenge that is making her so unhappy. He asks his father to release Kurumi once more. Bunzo pushes his eldest son done and says he will never give his possession to a loser like Mitsuru. This angers Mitsuru and he gets up with a mad glean in his eyes. He punches his father repeatedly for saying he likes using lonely women as they are easy. 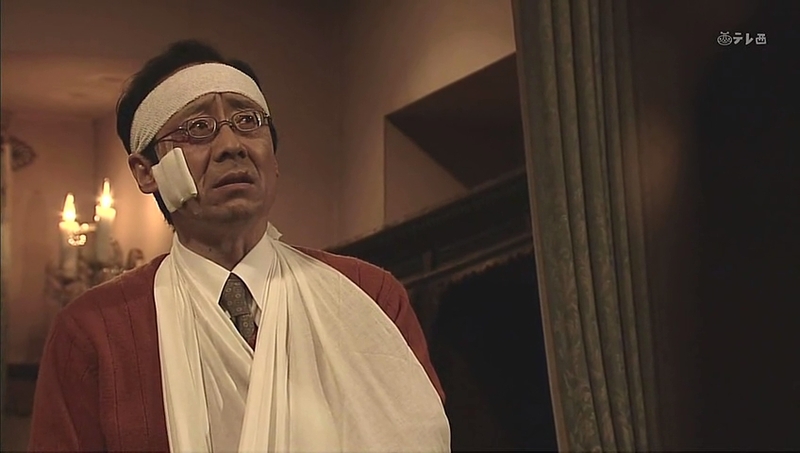 Oguri comes in and we get the scene where Oguri accidentally falls down the stairs in his struggle to stop Mitsuru. Bunzo comes out and tells his eldest son he finally committed murder. Bunzo then starts yelling that the murderer is there and Mitsuru can only stare in shock, horrified. Isao is finally released and goes back home where Ryo, the servants, and Kanako are waiting for him. They are happy that he’s home. Isao asks after Oguri and tells him not to push himself. Oguri replies that he’s fine. Kanako then asks after Mitsuru—when can he come home. 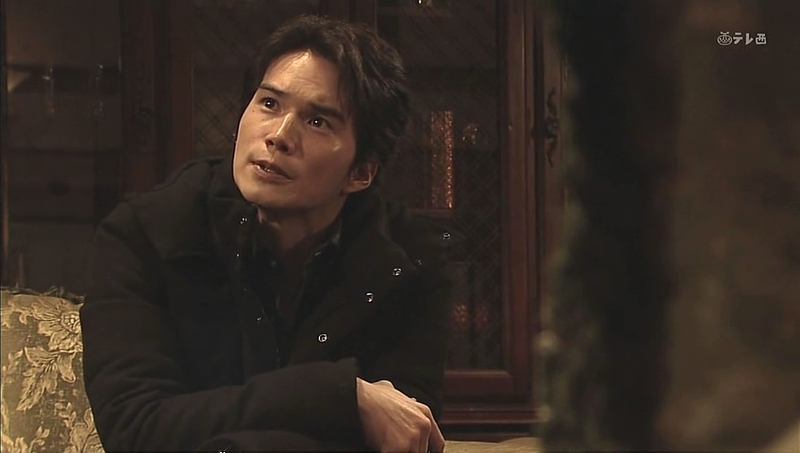 Isao sits down and says that Mitsuru has been arrested as a suspect for killing Bunzo. Kanako cannot believe this—Mitsuru would never do such things. Isao says there was a witness who testified. 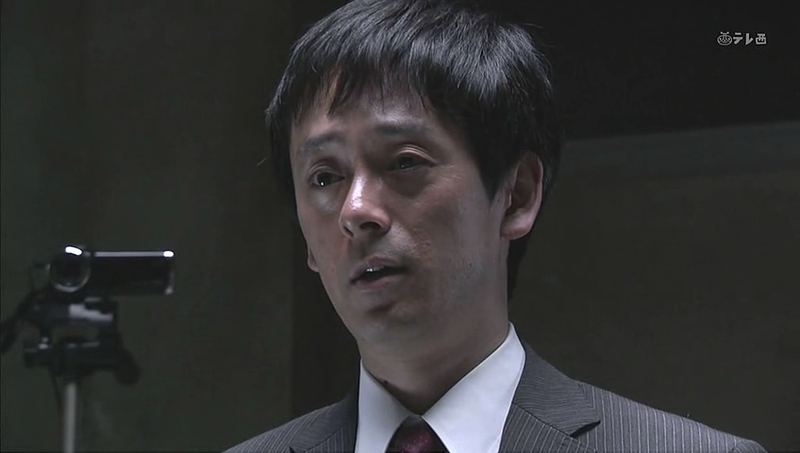 Oguri reveals that he was the witness. 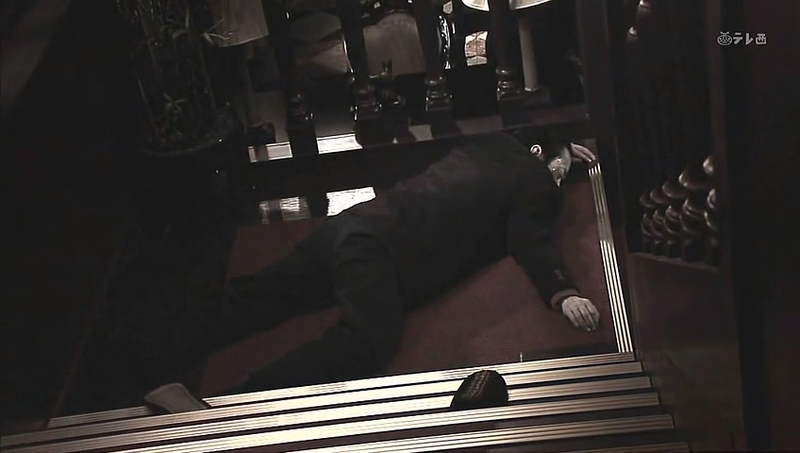 I don’t like how they keep saying that Mitsuru intentionally pushed Oguri down the stairs—he didn’t. He accidentally shoved the servant downstairs. Isao says that there is also DNA evidence. Kanako says that can be from the fight. Oguri says that even though he wishes to believe in Mitsuru, the eldest Kurosawa brother had the most reason to kill their father. Isao says all appearances point against Mitsuru. Kanako and Ryo say it is all circumstantial with no solid proof. Isao says even if there is another suspect, it would have to be someone who knew the family well. Suematsu says that give Bunzo’s actions, there are a lot of people with grudges. 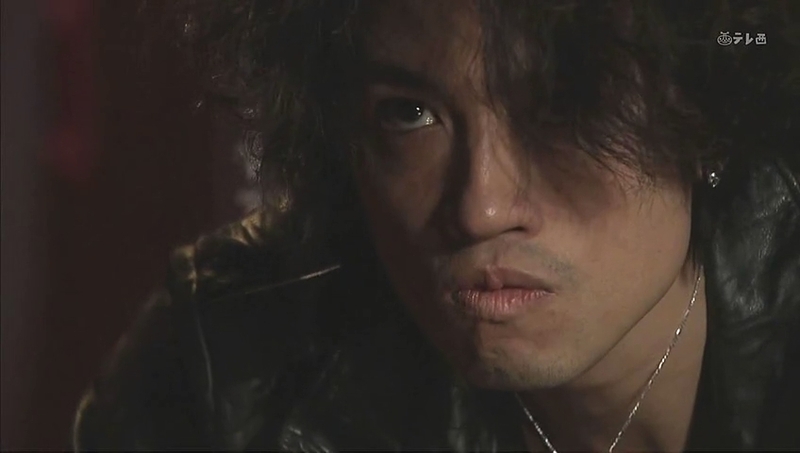 Oguri yells at him for slandering their dead master. Isao then says that he will look into matters calmly and collectively. 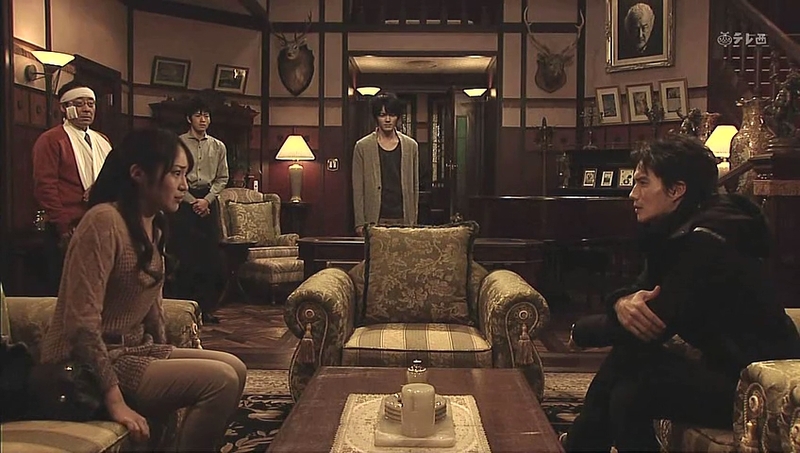 This angers Oguri—don’t the boys feel pain over their father’s death? He was killed in that house in his own room which should have been the safest place. Oguri then excuses himself. Back at the station, Irie happily cuffs Mitsuru and takes him out of the interrogation room. 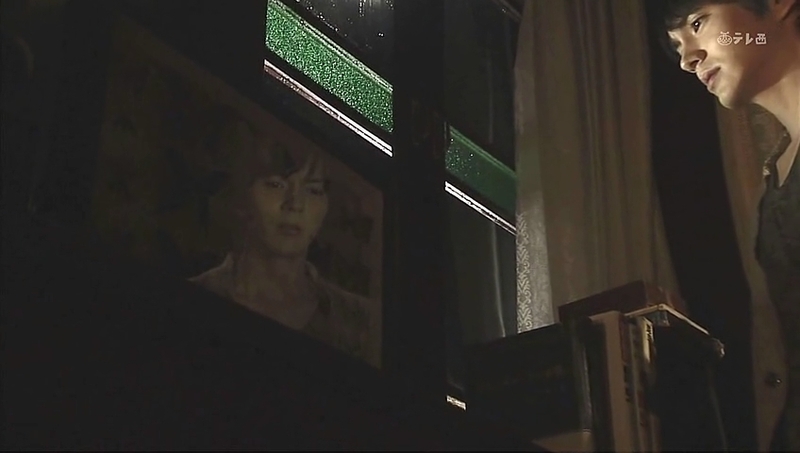 Ryo stands in his bedroom and stares out the window and wonders what he should do… hmmm… curious. 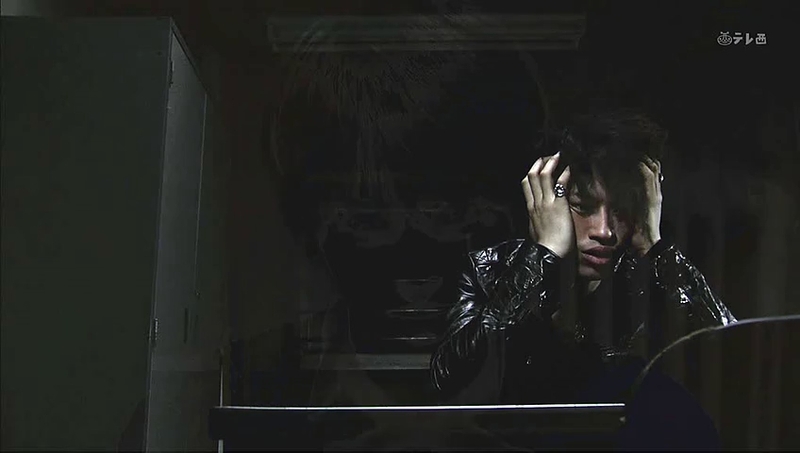 Does Ryo know something or is he just wondering what he can do to save his eldest brother? 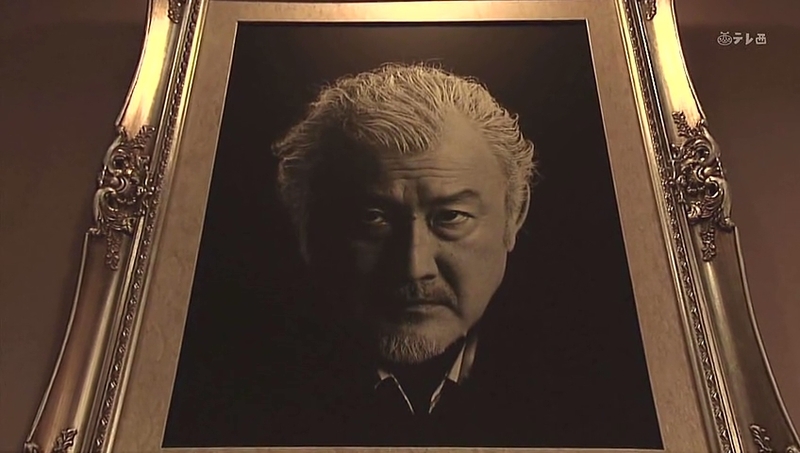 Isao walks downstairs and looks at his father’s portrait. He kind of grimaces a smile—he’s finally set free from Bunzo. And that’s where this episode ends. I’m actually surprised they can drag this out for so long, but since it’s only about 30-40 minutes, I guess. Things will heat up even more next week.